Hunter Bryson Bennett was born on April 21, 2006 to Bryson and Emily Bennett in Provo, Utah. Hunter was diagnosed with Lissencephaly at 4 months old and was predicted to only live 2 to 5 years. During his first years Hunter was a traveler. He visited Southern Utah, Idaho, Las Vegas, San Diego, Orlando, Spain, Italy, and France. Hunter received his first feeding tube at 18 months old, and at the age of two he received his first wheelchair and his first sister, Eleyna. Hunter lived in Orem, Utah until he was two and then moved to Provo, Utah. Hunter’s dad equipped the Provo house to work with his wheelchair. Both the Orem and Provo houses had beautiful yards with trees and gardens. Hunter spent a lot of his summers outside. Hunter’s brother Rockwell soon joined the family and they then moved, for a short time, to Lehi, Utah. His sister Bria made her entrance to the family at the Lehi house. When Hunter was six years old, his dad had a crazy idea to move to Queen Creek, Arizona. Dad packed the moving truck and headed out. Hunter followed with his mom and new baby sister. It was the ride of his life. The landing in Arizona was a little rough but the Bennett’s soon adjusted to the sunny weather. A month after they moved, Hunter went on an epic boy’s trip with Dad back up to Utah to get a new feeding tube and wheelchair. The ride home, with Hunter stretched out across the back seat of the truck, was one neither Hunter nor his dad would ever forget. Hunter settled in to life with no winters; he really enjoyed the sun and warmth of Arizona. Hunter’s youngest brother, Wesley, joined the party when Hunter was nine. His parents decided to buy a 45-year-old house on some land in Gilbert, Arizona and remodel it to accommodate the growing family, and mainly, the growing of Hunter. Hunter moved into the house right after his 11th birthday. He had a new room, new shower, no steps, and many features he and his parents enjoyed. Hunter liked very similar activities throughout his life. He loved going to the movies, especially every year for his birthday. He saw more PG-13 movies with his dad by age four than any other child. He particularly enjoyed watching gunfights and car chases. Hunter loved to be held. Even at age 12 his favorite spot was on somebody’s lap who was big enough to hold him. At age 7, Hunter got a wheelchair van and a motorhome in the same month. The growing family could then fit in one vehicle, and his buff Mom no longer had to lift the wheelchair into the back of the van. He loved his motorhome. Not many seven-year-olds’ can claim they got a motorhome as a present, but it was Hunter’s favorite toy. Every summer he was able, he took the motorhome to the beach in California and his family was able to tag along with him. It was a big sleepover with all of his siblings and he loved it. The ride was as exciting as the destination. Hunter also loved to visit Disneyland and he went several times throughout his life. His siblings called him their Fast Pass because they could skip the lines with a brother in a wheelchair. Hunter was a little hesitant on the Cars ride, with Dad trying to support him from the next seat on the fast turns, but he did not want to let his siblings down and make them wait in the 2-hour line. Sometimes you have to take one for the team on family vacations, Hunter was not excluded in that. Hunter got a new wheelchair van at age nine, one that had better air conditioning. He loved the van and he spent many hours in it back and forth from doctors. His dad felt he was exempt from the traffic laws, so Hunter laid across the back seat that folded into a bed on most of the return trips from the hospital. It was nice to relax with the shades down and the A/C blowing right on you after those long appointment days. 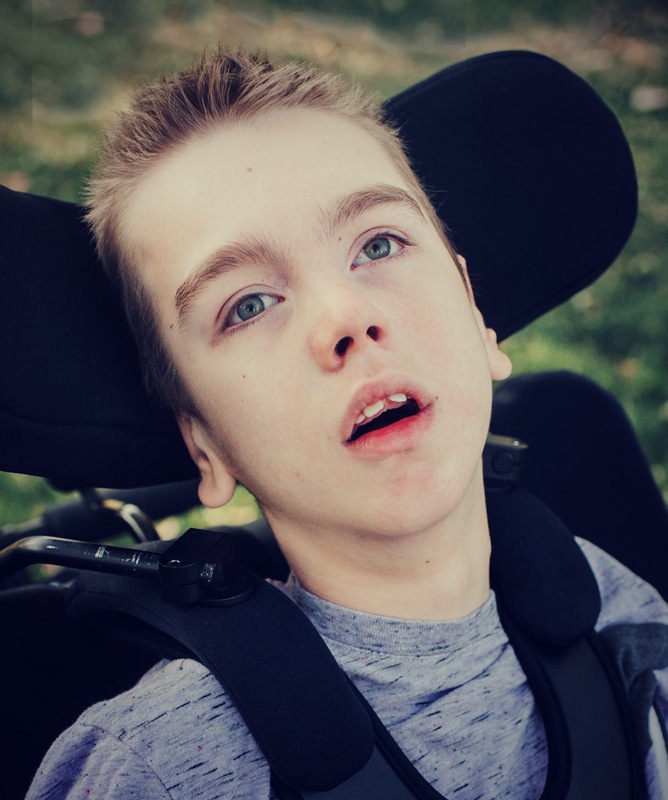 Hunter was able to attend some school and had many great teachers and therapists, but the majority of the care for Hunter occurred in his home. His parents did all of the care for the first half of his life but needed some extra hands as he and the family grew. Hunter’s spirit attracted such sweet caregivers into his home, including Emily, Celeste, Samantha, Cassidy, Savannah, Kelsi, and Candin. Most 12-year-old boys are a little awkward around cute 19-year-old single girls, but Hunter was very mature for his age. He was the envy of every young man at the singles ward and was known as quite the ladies man! Hunter required 24-hour attention and these girls served him and the family with great care and tenderness. His mom was always close, and if she wasn’t, the nanny cam was…. Hunter also had nurses during the night that helped out for the last few years of his life. Dawn, Robin, Danny, Margie, and Judy, from Thrive, served Hunter with exceptional care to keep him as cozy and comfortable as possible while his tired parents slept. For a few years in Utah, Hunter did equestrian therapy and loved riding his horse with his therapist Laura. Hunter loved seeing his extended family at reunions in Idaho, Utah, and California. He went camping, boating, snowmobiling and experienced life the best he was able. His favorite moments, however, were at home, sitting in his favorite position on the floor or couch and listening to the chaos of 5 siblings full of love and life all around him. Hunter was able to meet his new sister, Gemma, 6 months ago. She brought the family to an even 3 boys and 3 girls. Hunter was always a big part of the family and was the best big brother. He was always available to snuggle if anyone was sad. If you were worried or anxious about anything in life he had a calming sense that made it all ok.
Hunter made everyone slow down and listen to the promptings of the Spirit. What was lacking in capacity in his mortal body was amplified with his courageous soul. Hunter’s health struggled his whole life, but especially the last 18 months of his life. He finally completed his mission here on Earth on May 7th and returned home to his Heavenly Father. He will always be remembered and adored by those who dedicated time to be with him. We love you Hunter. We are truly sorry to hear about this difficult time for your family, and the passing of sweet Hunter to the other side of the veil. Hoping that the Spirit will bring you comfort in the coming days and weeks, and that your tears of separation will one day be replaced by tears of anticipation for the day you will be together again. We love you! What an amazing boy with an amazing family, I’m so grateful I’m his aunt. Love you guys! Beautiful Memorial Service, Obituary, Speeches, Music, etc. Very emotional. Teary-eyed congregation. Well, at least me. We all Love Hunter & Your Family! Take Care. We are so sorry for your loss and the separation from Hunter for a time in mortality. We wish for the Holy Spirit to comfort his loved ones now and for many years to come. Aren’t we grateful for the knowledge that life continues without the frailties and illnesses of mortality, freeing us to joyfully learn, mature and help in The Father’s work?! God bless you all! Oh Emily! What an honor to be the mother of this remarkable boy! There are no coincidences and surely your amazing family was chosen for this great adventure! Love you and send sympathy and love to all of you and special warm hugs to you! Love you forever! I am so sorry to hear about Hunter. My condolences to you. I have always felt that he lived such a long life due only to your love. May God bless you. Although we never met Hunter in person in this life, I know that Dayton and Hunter know each other. I know their spirits are close and I know Dayton felt Hunter bear at his funeral. This works is a much better place because of Hunters life here, and because of the many lives he touched through the service that was given to him and the service he gave in return. I know he loves you deeply, Emily and Bryson. I know he was so full of gratitude for being raised in a home with so many choice and special little ones surrounding him. Thank you for providing this for him. He loved unconditionally. I know that his spirit will always be close to comfort and guide and love his family members now that he is in heaven. He gives me strength, as well. I wish all of us had a Hunter in our homes. I love him and his family and am so grateful for their influence on my life and in this world. I never met Hunter but heard about him from his loving grandmother, Julie Durrant. I know how much the entire extended family cherished this young man. Reading the obituary from Provo filled my soul with love for him and his amazing family. You gave him every care and opportunity possible, well, more than possible. May the Lord bless you for your goodness. May his loss be assuaged by the peace of knowing where he is now continuing to bless the lives of others. What a precious boy! My daughter is going on 18 and very similar to Hunter. Thank you for sharing all the wonderful things about Hunter!